One of Toronto’s most consistently hilarious people, the great Tricia Black is the living embodiment of the Outstanding Sketch or Improv Production category, nominated as part of the ensemble of both a sketch show (She the People at Second City Toronto) and an improv troupe (Kinsey Fail as part of Bad Dog Theatre’s Proud + Funny Festival). We caught up with Tricia to ask her all the hard hitting questions like “what’s the best bad joke you’ve ever told”. Can you remember your first experience with comedy? My first comedy experience would probably have been in elementary school. We did a play originally called Mr. Peabody’s Package– interesting title. But there were no boys who could play the part of Mr. Peabody so they changed it to a women, and I played Mrs. Peabody, and it became Mrs. Peabody’s Package. Couldn’t for the life of me tell you what the play was about but I’ll never forget that title. I think I knew I wanted to be a comedian from a young age, though I was super shy when I was younger, I was still able to be a bit of a class clown. And then in University I started getting cast in solely comedic roles, starting with the role of the Lion in The Wizard of Oz, and the rush of making people laugh hooked me in. Then I found improv and there was no going back. What’s your favourite sketch you’ve ever done? My favourite sketch that I’ve ever written is this one that is so incredibly hard to explain. It’s a dumb sketch I wrote with Allison Hogg while in the Sketchersons, its an incredibly physical sketch, and one you gotta see. Let’s just say it involved a ton of Lady Antebellum records. We are doing it again June 2nd at Comedy Bar for Sketchersons so come see it then, you wont regret it! Another sketch that I am super proud of that was part of A Comedy Extravaganza Eleganza, an all queer cast sketch review, was a sketch I did with Jillian Welsh. It was about two mothers sending their son off to college and then rewinding to a beautiful Hey Rosetta song through their whole life together. It was a moment of ‘this is comedy but this is also heart’, and I think comedy needs that sometimes. Anyway it was beautiful. That’s a tough one cause there are so many so I am just gonna list them all here. The Cast of The Golden Girls. Catherine O’Hara, Carol Burnett. The Cast of She the People, The Cast of A Comedy Extravaganza Eleganza, Cast of Kinsey Fail, Carly Heffernan, Ashley Botting, Chanty Marostica, Carolyn Taylor and all the the Baroness Von Sketch Ladies. All of the Sketchersons. Honestly there are a million more!!!! I could go on forever! I’m from the East Coast so probably something about the ocean. I think one I heard once and retold was — Why did the fisherman suddenly redirect his boat? Tell us about She the People and how that show came together. She the People came together first in Chicago. They decided to bring together an incredible cast and writers room of only women, lead by Carly Heffernan. And the show was incredibly successful down there, Second City decided to bring it to Toronto as well, again lead by Carly. Then Carly put together a cast and here we — very gratefully — are! The show has an all-star female cast. Tell us about your castmates what each of them brings to the show. Karen Parker has incredible timing, even if she is trapped in a dinosaur costume. She is also an incredible actor, when there are softer moments in the show she really allows the audience to empathize with what is happening in the scene. Ashley Comeau is so infectious. She’s charming, and is willing to just be such a goof on stage and so committed, and great at deadpan. She also has a stunning singing voice! Paloma Nunez has this wonderful way of showcasing how her character is feeling with just a look, and her dry humour will having you laughing. But she also gets this incredible speech that she delivers with such power that it makes people in the audience weep. Kirsten Rasmussen — there is no one who is better at character work than this woman! Everyone can fight me on it. She brings a character to life with her physicality, commitment, and her facial expressions are some of the funniest things I have seen. Ann Pornel is a force of nature!! She is fierce, funny, fabulous, and you can’t take your eyes off of her! I honestly don’t know what else to say except that she is a FORCE! Then there’s me, who Karen Parker once described in an improv scene as a “living muppet” — and she is not wrong. I LOVE ALL OF THESE WOMEN. GO SEE THEM IN EVERYTHING. GIVE THEM EVERYTHING! There is a scene in She the People where I miss pronounce Charcuterie. Then get really angry at myself and start flipping tables. It’s my Chris Farley moment, where I just get to yell and be physical. It is also great if you are angry in any way — its a release. Also usually being a trickster sometimes and getting the girls to laugh a little in the scene is always fun. The Second City caters to a lot of tourists and corporate audiences. What have been some of your most memorable experiences interacting with audience members? There is a great moment in She the People where we ask if there are any fellas in the audience, and when someone yells we all crowd around them to make them feel uncomfortable. It’s fun to watch them laugh and actually enjoy the uncomfortable. You’re nominated against yourself with your sketch show She the People facing off against your improv show Kinsey Fail. Do you want to yell at us for making this one category? YES! HOW COULD YOU DO THIS TO ME!!! But in all seriousness it is just an honour to be thought of. And both shows are incredible, and so different in their own ways. How did you get involved with Kinsey Fail? 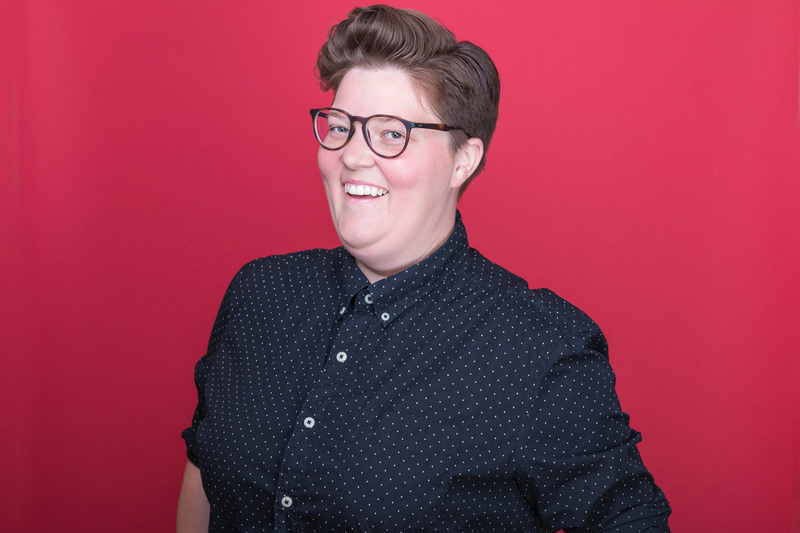 I got involved with Kinsey Fail because my long time friend Tom Hearn came to me and said that he wanted to start an improv show entirely of queer performers, and I immediately was on board. An all-queer improv troupe was something that hadn’t really existed in Toronto. In your time performing with that group, is there a scene that stands out in your memory as particularly funny or impactful? I think my favourite moment was when Gavin Crawford hosted, and he told us a story where he faced homophobia, and about the unfortunate idea of Gay Bashing. So we turned that into a group of us in a small town welcoming someone (with all the good intentions) with a Gay Bash. So basically a party. It was so funny, and warm and silly, but you put a positive spin on something so negative! Who has been your favourite Kinsey Fail storyteller to improvise around? I think Gavin Crawford. He had such rich stories that were so wonderful to use as inspiration and find connection to. Both Kinsey Fail and She the People foreground demographics that are often underserved by the comedy community. What are some of the ways in which having these platforms has affected your comedy and your career? Having these platforms have affected my comedy and my career immensely. Having the ability to show the world your point of view, and have them empathize with a demographic they haven’t seen as often is an amazing feeling. These shows have also allowed me in my writing to lean more towards experiences I have had, which makes for truthful comedy. I’ve got a lot on the go which I am so very lucky for. A Sketch Comedy Extravaganza Eleganza is coming back as an official Pride event, and will be playing at Second City for three Thursdays starting May 30th. My theatre company in Tweed, Ontario — Tweed & Company Theatre — has been growing and becoming more successful. We write original Canadian musicals, and we have a couple in- development that I am working on. And another fun show that you’ll have to wait and see cause it’s still a secret but I am sure you’ll know soon — the antici…pation!